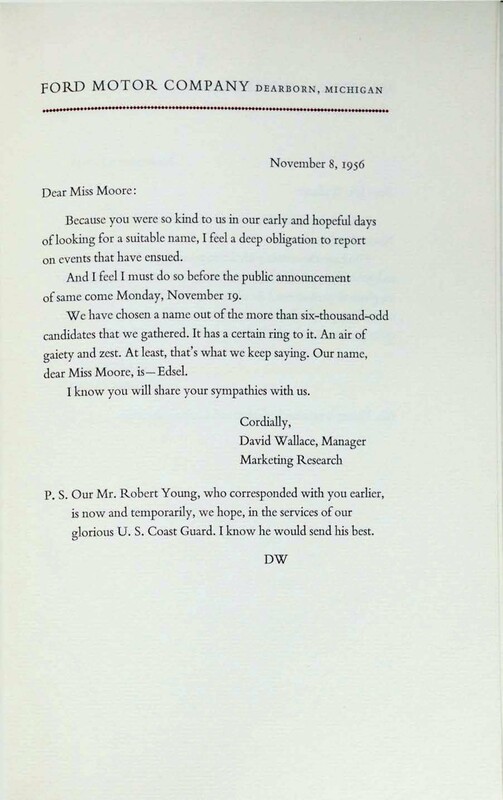 On October 19th in 1955, Robert B. 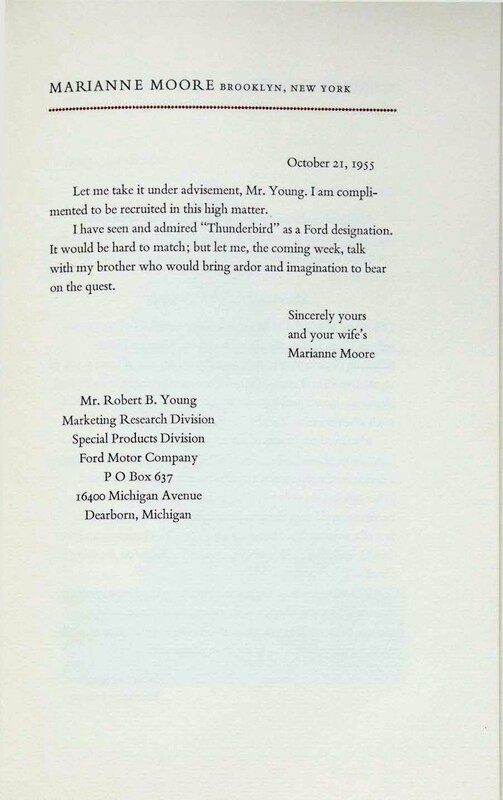 Young, the head of the Marketing Research Department at the Ford Motor Company, sent a letter to Marianne Moore to ask if she would help the company in coming up with a name for Ford’s newest series of cars. 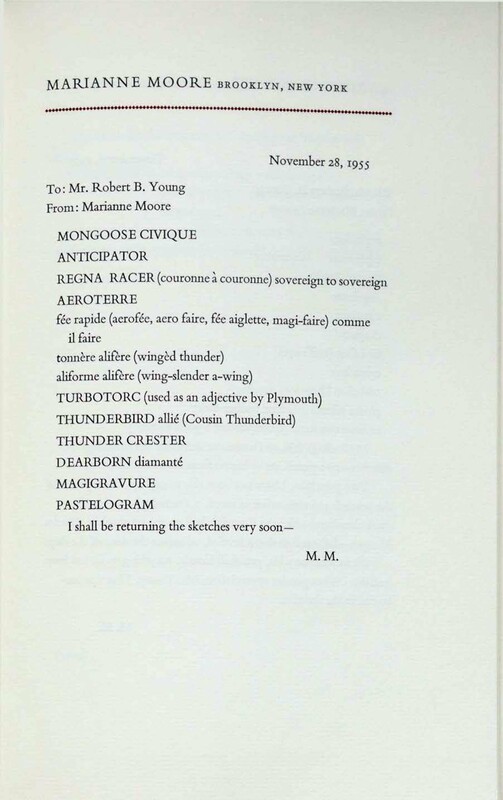 What followed was a yearlong written correspondence between the businessman and the poet in which Moore suggested hundreds of possible names for the Ford E-car, what would eventually become the “Edsel.” Some of her suggestions include the “Ford Faberge,” the “Mongoose Civique,” the “Pluma Piluma,” the “Turcotinga,” and, perhaps the most infamous of all, the “Utopian Turtletop.” Moore and Young’s letters were collected in a book that I found during my visit to the Watkinson titled, “Letters Between Marianne Moore and the Ford Motor Company.” The book is particularly fascinating because, as the correspondence continues, we see Mr. Young realizing that he may have bitten off more than he can chew in his attempt to work with the very eccentric Moore. 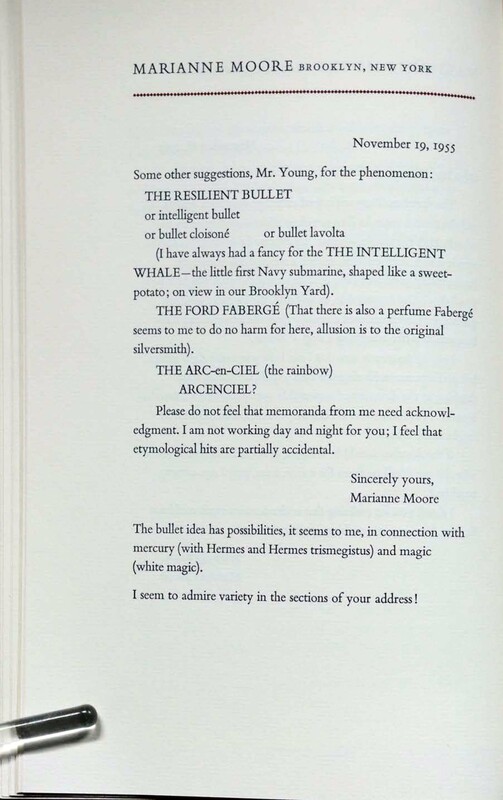 It is fascinating to examine how the tone of his letters change as Moore continues to send page after page of bizarre names for the Ford E-car. 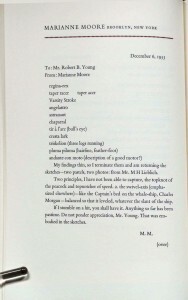 In his first letter to Moore, Young’s tone is extremely humble as he requests help on a problem that is, as he says, “more in the field of words and the fragile meaning of words than in car-making.” Young repeatedly establishes himself as Moore’s inferior on the subject of words and he holds her up as an expert. He writes, “We are seeking the help of one who knows more of this sort of magic than we.” His use of the word “magic” frames Moore’s artistic work as something that transcends the more mundane world of car-making. Young seems to be engaging in some flattery here in the hope of enlisting Moore as a consultant. 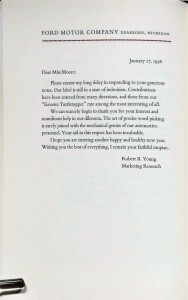 Young is successful and Moore agrees to help, but he quickly runs into difficulty as he tries to establish the terms of their business relationship. 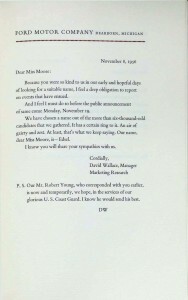 Throughout his letters, Young repeatedly tries to settle on a method of payment for Moore’s services. 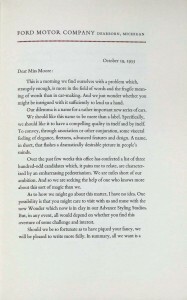 At the end of his first letter he writes, “Of course, it is expected that our relations will be on a fee basis of an impeccably dignified kind.” Moore does not acknowledge this comment in her responding letter and simply says, “I am complimented to be recruited in this high matter.” Young becomes more insistent about monetary reimbursement in his second letter saying, “in compliance with procedures in this rigorous business world, I think we should make some definite arrangements for payment… before pursuing the problem further.” Moore once again fails to respond to his comment and instead responds with her first suggestion for a name, “The Silver Sword.” She then launches into a lengthy description of the Haleakalā Silversword, the rare Hawaiian plant that inspired her suggestion. 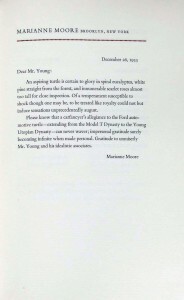 Young mentions money for a third time in his third letter to her. 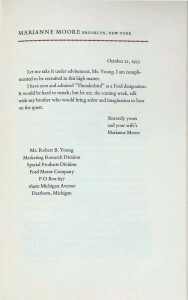 He writes, “It is unspeakably contrary to Procedures here to accept counsel… without a firm prior agreement of conditions (and, indeed, without a Purchase Notice).” While Young repeats himself about the issue of payment, Moore simply continues to send him fanciful suggestions for the E-car. 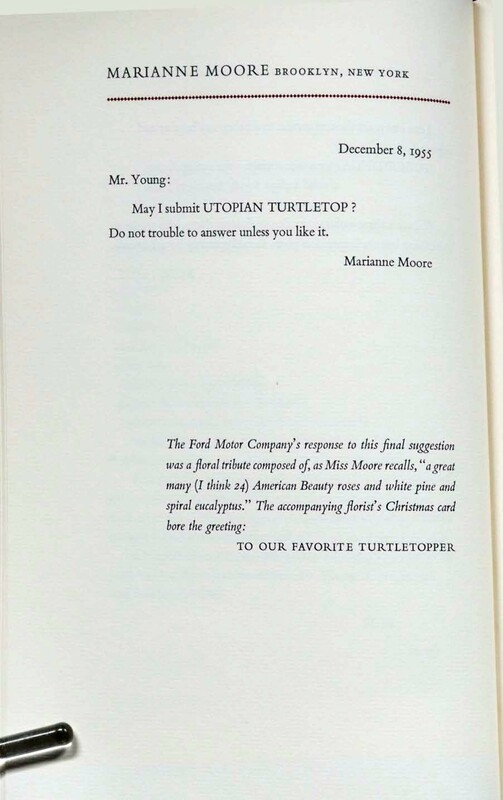 In this third letter, Young even asks Moore to stop sending him so many suggestions. 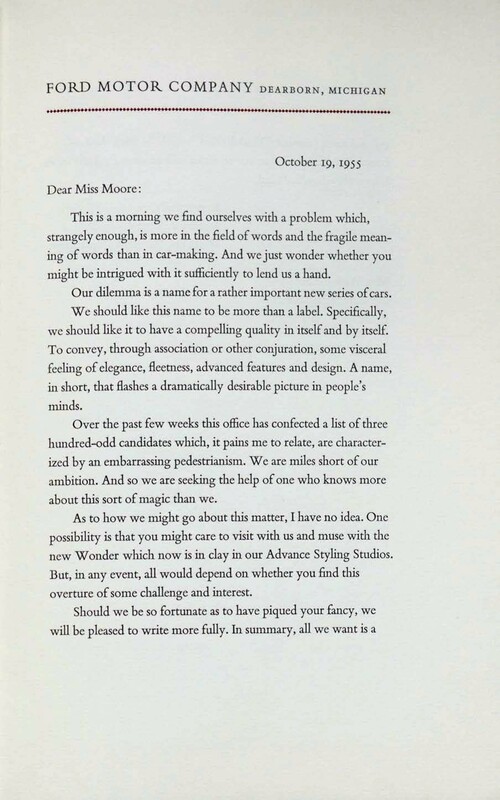 He writes, we propose “a recess in production for orderly bookkeeping.” Despite this comment, Moore continues to send letters in which she muses about the car’s name. At this point in the correspondence, it becomes clear that these individuals do not understand each other. For Young, this is his job and he intended to bring Moore on board as a paid consultant. For Moore, this is most likely a fun task that she has chosen to take on. This disparity in their objectives leads to a correspondence that is ultimately unproductive. 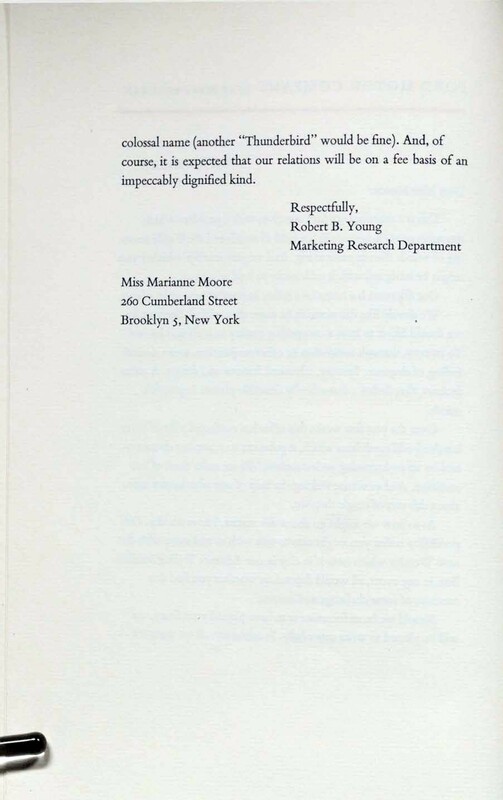 In Young’s last letter to Moore, it is clear that his attempt to utilize her help has largely failed. 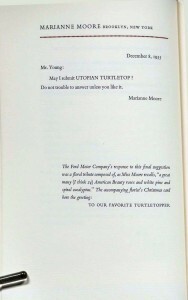 He writes, “contributions have been entered from many directions, and those from our “favorite Turtletopper” rate among the most interesting of all.” Note that he does not say the “best” of all. He says the most “interesting” of all. 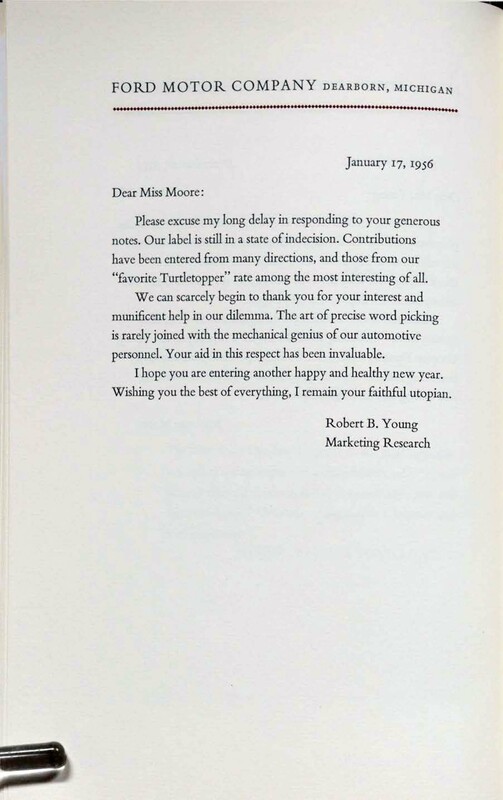 Young goes on, “We can scarcely begin to thank you for your interest… in our dilemma.” The word “interest” is particularly loaded because it would suggest that Moore approached Ford to offer suggestions when, in reality, it was Young who approached her. 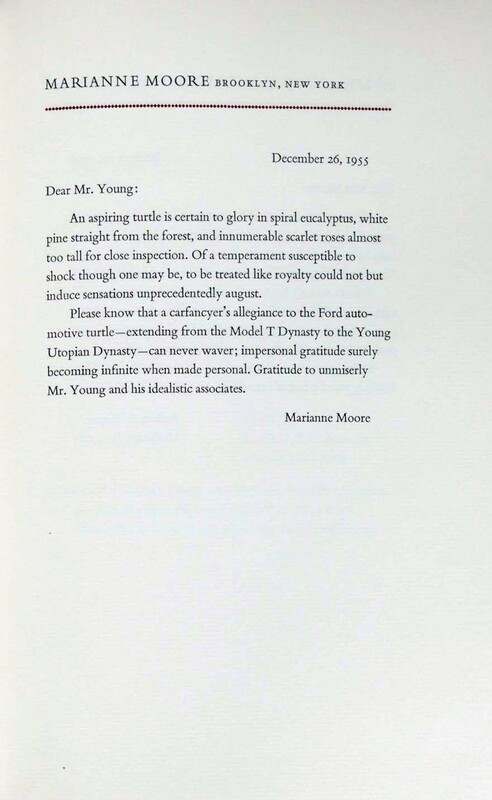 It seems as though Young is trying to let Moore down easy because he has realized that he cannot establish a steady or productive working relationship with her. 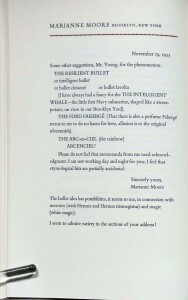 These letters are truly unique in how they shed light on Moore’s interactions with the non-artistic sectors of society. I do not know who chose to compile these letters in a small book, but I do know that the book is one of only five hundred and fifty copies. 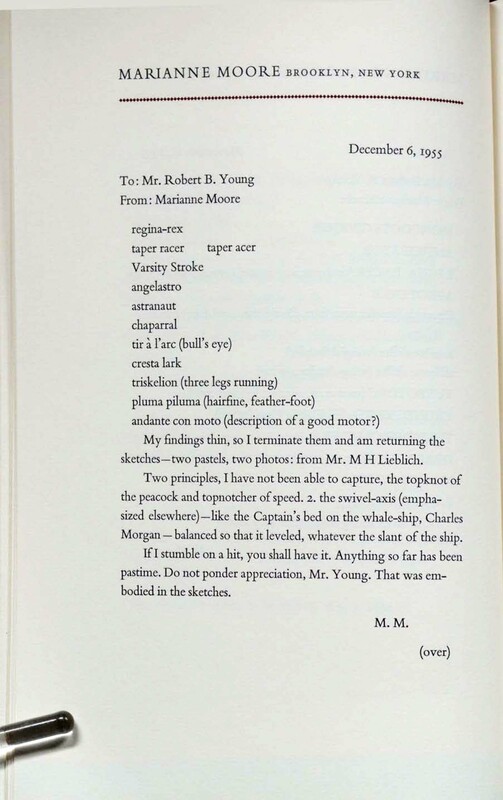 I imagine that this book came about because someone wanted to preserve this unique look at the personality of Marianne Moore. In the early 1960s, less than a decade after Wallace Stevens’s death at age 75, Trinity worked with his daughter Holly and the University of Connecticut archives to put together an exhibit on the poet. The exhibition focused partially on correspondences that Stevens kept up with friends and publishers, and also explored a significant portion of his personal collection of artwork that, presumably, influenced his own approach to poetry. Much has been made of the man’s fascination with burgeoning artistic movements, and the prints available help to flesh out a portrait of how Stevens explored the visual arts in service of his poetry. Buried within a pile of these prints and correspondences, though, a small pamphlet caught my eye. Provided, presumably, by Holly for the exhibition, this rather unassuming program for the Poetry Society of America’s 41st annual dinner suggests an interesting personal, and familial, side of Stevens that isn’t usually immediately evident in his work or in the common conception of the reticent insurance man who made pains to keep his poetic excursions separate from his Hartford business life. The artifact also tells us a bit about Stevens’s world in the poetry community, and about the evolving reception to his work. The 41st annual dinner occurred in 1951, and it’s worth noting that Stevens, our guest of honor, as well as the Honorary President (Robert Frost), and the Honorary Vice-President (Leonora Speyer) were all elder statesmen of American poetry by that time. It’s also worth noting that, among so many of their contemporaries who travelled overseas extensively and blurred the lines of professed nationalism, Speyer, and particularly Frost and Stevens, were all primarily American poets, making them prime candidates, naturally, for this poetry society’s recognition. The gathering was a celebration of the old guard, full of long-overdue odes to Stevens’s Harmonium from those early adopters who saw its worth well before the critics. Said A.M. Sullivan, it “made me aware for the first time of a person’s ability to enjoy poetry without the necessity of explanation or justification.” The celebration of poets passed, and the honoring of those formative to the “American” movement speaks to an appropriate concern with the foundations of American poetry. 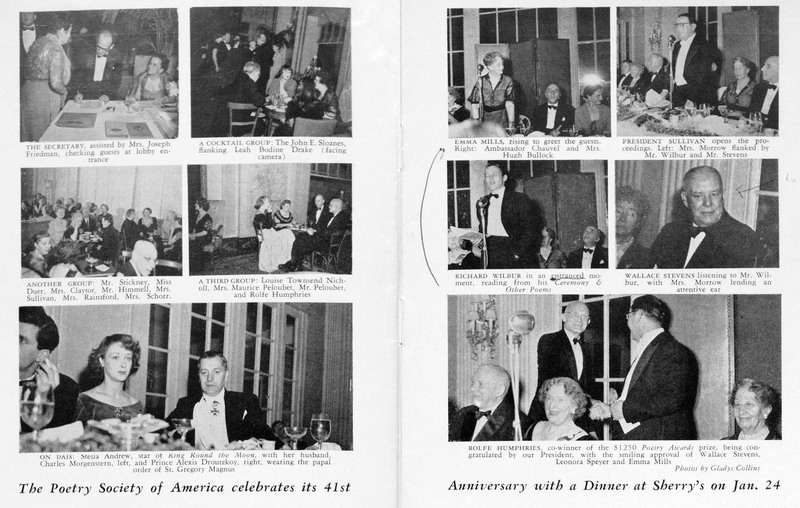 Additionally, the dinner was an occasion to meditate on the nature and presence of American poetry on a global stage, and a celebration of its current representatives. Similarly, a glance through guest list suggests that the society was, possibly, more concerned with the social visibility of poetry and poetic support than with the virtues of poetics themselves. With this in mind, Holly’s brief notations on the page showing her father are open to a range of interpretations. Under one picture, captioned “Richard Wilbur, in an entranced moment…” Holly underlined “entranced,” which undercuts the gravitas of the situation, and suggests, somewhat sarcastically, that the pomp and circumstance and florid language of the event was somewhat less than genuine, or, at the very least, trumped up to excessive proportions in either the intended perception or in the retelling. In the next pane over, Stevens himself takes center stage, “lending an attentive ear” to the proceedings. In the margin, with an arrow pointing to her father, a daughter’s “ha” complicates the scene immeasurably. It could be a simple piece of familial teasing, a goofy picture warranting a small jibe, or an inside joke between parent and progeny. Given what we know of Stevens, with his reluctance to discuss his poetry, mixed with the smattering of dignitaries, ambassadors, and actual poets in attendance, the notation, and Stevens’s expression, could be read as a signal of discomfort among the bombast of the occasion. The underlined “entranced” would certainly suggest that Holly was of the opinion that this group took themselves a bit too seriously (whether the group themselves shared this opinion remains less clear, although the text alone would suggest a certain formality), and paired with the somewhat inscrutable expression on Stevens himself, these two simple notations open a world of possibility about the truth of an experience otherwise unapproachable through the text itself. At the very least, these marks serve to humanize and humble. We tend to lionize our heroes, and even our attentions to their personal lives come through a reserved distance. Holly’s marks, however slight, give an intimately unguarded lens, and partial clue, into her father’s appreciation of his poetic society. 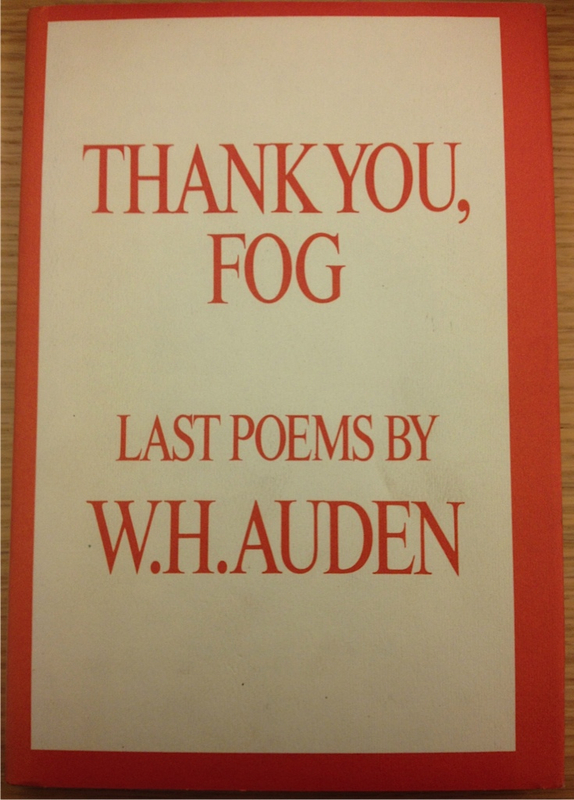 What I found in the Watkinson was Thank You, Fog, a posthumous collection of poetry by W. H. Auden, published in 1974. The poems in this collection were written in 1972 and 1973, up until Auden’s death in September 1973. At the time of his death, Auden had already assembled the poems he wanted to be in this book, and had selected its title and dedication. 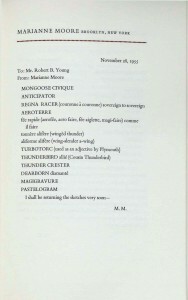 He was preparing it for publication by his literary executor Edward Mendelson. the good Lord would take him. Mendelson’s commentary and the inclusion of Auden’s last poem ever written provides insight into the end of Auden’s life and how his poetry progressed over the span of his lifetime. 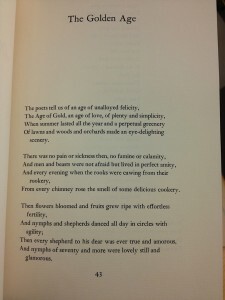 Auden wrote about old age, and death, and coming to terms with old age and death. You can also see his religious influences more prominently than in some of his earlier poems. Especially in this final poem that Mendelson included, Auden came to accept his death and wished that “the good Lord would take him”. Auden is typically considered to be an anti-romantic. He presents the world in a scientific manner, and writes in a orderly, neat writing style. His earlier poems are rooted in concrete images and colloquial language. While his style certainly carries over into his last collection, his ideas are more romanticized and abstract than in his earlier collections. The presentation of his poems was also different from that in some of his earlier works. His stanza alignment was more abstract, with many indented passages within larger poems, and asterisks breaking up stanzas. These poems were written during his short time in Europe before his death. He died in Austria in 1973, not in the United States, although he gained American citizenship in the 1940s. Some of his best work comes from the stretch of time that he was living in the United States. Was this elevated point in his writing career exemplary of the profound influence of his environment, or was it merely a combination of his age and skill at the time. This comes into question when looking at this later collection of poetry, written in Europe. Was the more abstract and pensive writing style primarily the result of his old age, or his environment? One also has to question how much of these changes came directly from Auden, and how much came from Mendelson after Auden’s death. When looking at a posthumous collection of poems, one can never be sure what the author’s original intentions were. For instance, part of what caught my attention about this collection was its color – the cover is orange. Did Auden intend for it to be that color? Or were his directions not that specific, and did Mendelson have to make these decisions himself? Also, were all the poems included in this collection meant for publication? 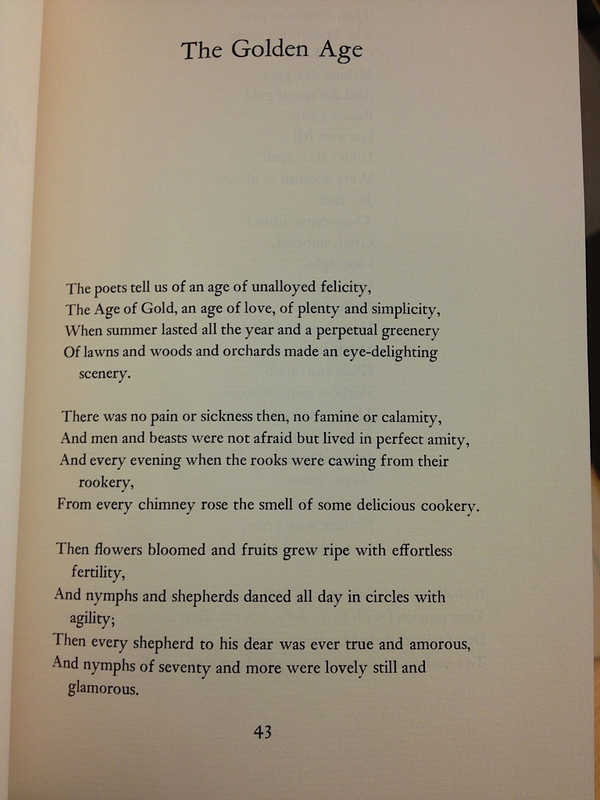 Auden did not want his last poem to be included in the collection, and yet Mendelson includes it in his introduction. Even with the most talented of poets, in a posthumous collection, not everything is worthy of release, even when in a fully completed form. 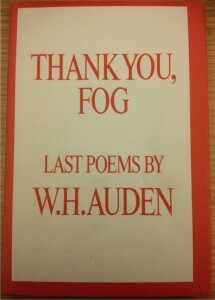 As a collection of poetry, Thank You, Fog is not Auden’s strongest work. However, its existence stands as a testament to his life’s journey as a poet, and the ways in which his writing style developed over time. 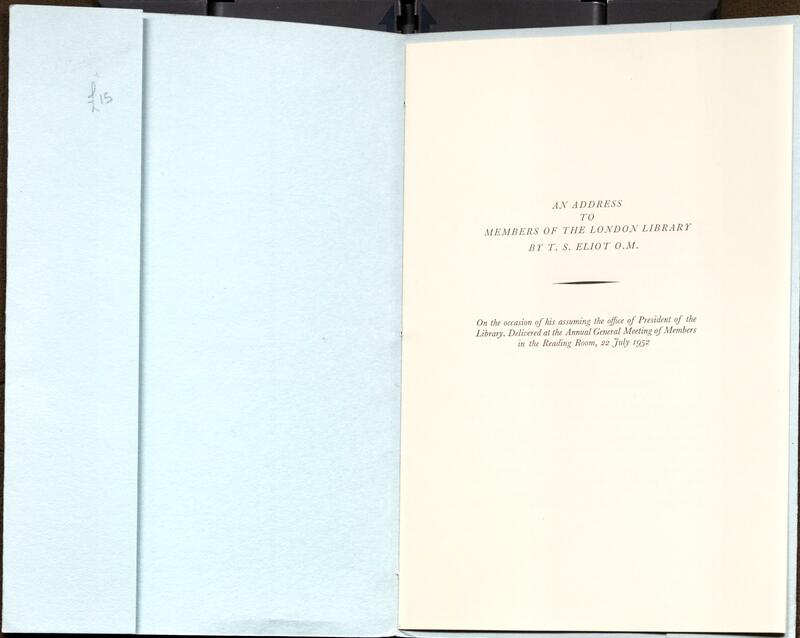 An Address to Members of the London Library by T. S. Eliot O.M. : On the occasion of his assuming the office of President of the Library. 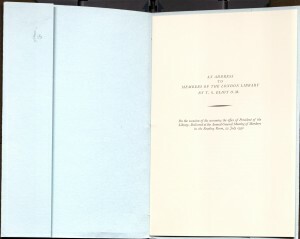 Delivered at the Annual General Meeting of Members in the Reading Room, 22 July 1952. At sixty-three years old, T. S. Eliot succeeded Giles Fox-Strangways, 6th Earl of Ilchester as the ninth President of the London Library. Other predecessors included Irish poet Alfred, Lord Tennyson and the Scottish essayist, Thomas Carlyle. Eight years earlier, the Library lost close to 16,000 volumes in a bombing during the Second World War. Today. The collection holds over a million volumes with 97% of the collection available for lending and at 173 years old, the Library is kept under the English playwright, Sir Tom Stoppard. In his address, Eliot attends to two questions: “Can such a library, limited to members and supported by subscriptions, survive? And, ought it to survive?” Eliot and his milieu have just traversed into modernity where there were many questions that needed to be addressed. Expatriotism and the Wars encouraged poetry and discourse to approach different methods. New styles were accepted. The social sciences had just entered the main stage and the modern artists were dealing with a new world in which its old God was announced dead. Having achieved a status of laureateship in poetics and in academia, and being credited as the father of modern poetry, T. S. Eliot looked on the members of the London Library as his next matter of business. Eliot had been prolific in his influence over literary discourse and he affirmed his own status. But Eliot’s intention was no more than to uphold the tradition of his predecessors so that the community may continue to survive. 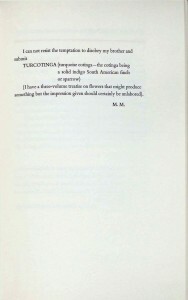 In his speech, Eliot isolated himself from his position as President in a way that echoed that echoed the tradition of literature rather than his own “parenthetical” anecdotes, which had “no direct bearing upon [his] main theme.” Eliot called himself indebted to the library, saying that without it, “many of [his] early essays could never have been written.” The Library became to Eliot what the café setting meant to Picasso. The difference: Eliot was content with his dialogue, which took place between himself and books. The collection of the Library, Eliot recalls as being the only “of [its] size which contains so many of the books which [one] might want, and so few of the books which [Eliot] cannot imagine anyone wanting.” This feat was only accomplished by the Library’s “certain homogeneity of membership,” which seemed to be a crucial element of the Library’s mores. However, with its selective style, the Library has curated a prodigious collection that has brought it to stand as the world’s largest independent lending library. The institution’s Carlyle Fund provides scholarship for those with a true interest in joining, but cannot pay the annual fee. In Eliot’s speech, he makes it evident that the availability of such a curated collection needs to remain standing, as it is vital to its culture as a whole. The absence of the London Library, “would be a disaster to the world of letters, and would leave a vacancy that no other form of library could fill.” With the scope of accepted literatures forever expanding since the days of the divide between high and low art, this simple booklet, which transcribes Eliot’s speech, reminds its reader of what role a collection of reference means to a culture. This cannot be the case of a library with “the awful burden of having to accept every book that is sent them.” The London Library’s Committee may provide for its interested members those publications that are worth preservation throughout this time and all time when discourse expands. What members gain is a haven of space where they are protected from the copious amount of lapsus linguae, which exists in literary output today. You are currently browsing the I Found It at the Watkinson! blog archives for December, 2013.